Last month it was announced that The UK Guitar Show would take place at London’s Olympia on September 29 & 30. The weekend event is brought to you by the organisers of the London Drum Show and the London Bass Guitar Show and is run in association with MusicRadar, Guitarist, Total Guitar, Guitar Techniques and Louder. Visitors will be able to enjoy a range of activities, performances and masterclasses – led by some of the world’s finest guitarists. Now, details of the acoustic workshops and tuition clinics have been revealed – with classes covering everything from ukulele for beginners through to intricate soloing techniques. The acoustic workshops will see 30-minute sessions from YouTube sensation Justin Sandercoe giving expert advice and tips, while Guitar Techniques magazine’s long standing classical tutor Bridget Mermikides will also be on hand to lead players through a range of lessons. The tuition clinics will see Jon Bishop running a Zero To Hero rock’n’roll session for beginners, while BIMM London’s head of live performance workshop Steve Allsworth will cover the fundamentals of funk rhythm playing. There’s no need to book – all the sessions will be on a first come first served basis. Visit the Tuition Clinic and Acoustic Workshop pages for further information. 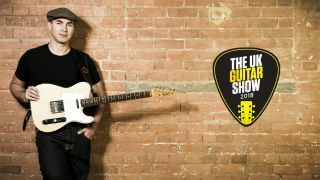 The UK Guitar Show will also feature a main stage with a variety of musicians showing off their skills, the Gear Hall where you’ll be able to try out and buy the latest guitars, a Guitar Garage where experts will give your instruments some TLC and the Vintage Zone, featuring rarities from top collectors, retailers and much, much more.